Figure 1: GPS speed (black) and GPS lateral acceleration (red) are shown for a lap at Willow Springs. This data is the same as used for the previous examples; here, lateral acceleration as measured by the data acquisition unit’s internal accelerometer is added (blue). While the internal accelerometer of a data acquisition unit can record longitudinal acceleration accurately, the same cannot be said of lateral acceleration. Figure 1 shows the same lap information as the previous examples, with GPS speed and GPS lateral acceleration displayed. To this, lateral acceleration as recorded by the unit’s internal accelerometer has been added. This data remains close to zero for the entire lap, and is practically useless, especially when compared to the GPS-derived data. Why is this? The discrepancy derives from the fact that the data acquisition unit leans with the motorcycle. With the unit at an angle with respect to the earth’s surface, the accelerometer is measuring the acceleration due to gravity as lateral acceleration. Just as the pitching of the motorcycle can have a slight effect on the longitudinal acceleration measured, lean angle has a much greater effect. You can feel the forces and acceleration involved if, for example, you drive your car on a banked road. If the surface is sufficiently angled, gravity will pull your body to the side relative to the car. Figure 2: When a motorcycle leans, the logger unit leans with it and records lateral acceleration as taken from an axis perpendicular to the motorcycle. In this case, the acceleration due to gravity must be incorporated as the unit’s accelerometer sees that as lateral acceleration. The vector sum of the acceleration has a direction such that the lateral acceleration measured by the logger unit is zero. 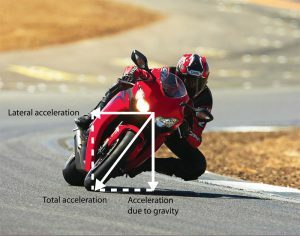 Consider the motorcycle being ridden upright, along a straight; lateral acceleration is zero, and the data unit will measure this accordingly. Now consider the motorcycle leaning into a turn; The logger unit will sense the lateral acceleration, but at a reduced amount due to the lean angle involved. At the same time, the unit will record the acceleration due to gravity as lateral acceleration as it is leaned at an angle. Sum the accelerations and directions involved, and the result is always zero or near zero. This is because the lean angle is always directly related to the amount of lateral acceleration, which is also directly related to the amount of acceleration due to gravity that the logger unit experiences as lateral acceleration. It doesn’t matter how much lean angle is involved, the next lateral acceleration as seen by the data acquisition box is close to zero. The lateral acceleration data does show some areas of non-zero activity however. This is due to several factors. When the motorcycle leans, the width of the tires affects the lean angle/acceleration vector addition slightly, and some lateral acceleration is recorded by the unit. Camber of the road also has an impact. And finally, when the motorcycle transitions side-to-side, the unit sees this as lateral acceleration and records it as such. In practice, the data recorded is not usefull, especially when the GPS data is available for analysis.